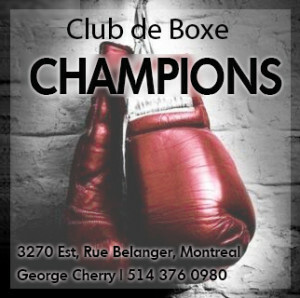 This Saturday, boxing fans get yet another heavyweight title fight that is not the battle that everyone wants to see. 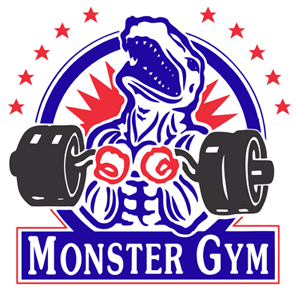 Instead of taking on Deontay Wilder, Anthony Joshua, the current WBA, IBF, and WBO heavyweight champion, not to mention England’s current heavyweight “good guy” (as opposed to the “bad guy,” Tyson Fury), will risk both his title belts and a truly monumental payday to face WBA “regular” heavyweight titlist (whatever that means) and mandatory contender, Alexander Povetkin. It’s an intriguing match-up in its own right, but definitely not Joshua vs Wilder. NOT the match-up everyone wants to see. While the Russian challenger has enjoyed much success inside the ring, Povetkin is perhaps better remembered for the two failed drug tests that tarnished his reputation in 2016. Nevertheless, he is now enrolled in VADA, has been reportedly clean ever since, and is coming off three dominant victories over Andriy Rudenko, Christian Hammer, and David Price. But as a 6’2’’ heavyweight in a division where the sky is quickly approaching the limit, the question is whether Povetkin has the size to deal with a 6’6’’ colossus like Joshua, who happens to be in the prime of his career. Those who are pessimistic about the Russian’s chances no doubt have a certain performance in mind. Povetkin failed miserably in his only bout against a heavyweight giant who knew how to use his size, that being Wladimir Klitschko. In 2013, “Dr. Steelhammer” did little actual hammering, but held, jabbed, mauled, and utterly neutralized Povetkin en route to a dreadfully one-sided unanimous decision in Povetkin’s homeland. Given the Klitschko debacle, the questions heading into the Joshua fight are whether Povetkin has improved his game since then, and if AJ will be able to use his stature as effectively as Wladimir did against the smaller man. Intriguingly, there’s plenty of uncertainty either way. 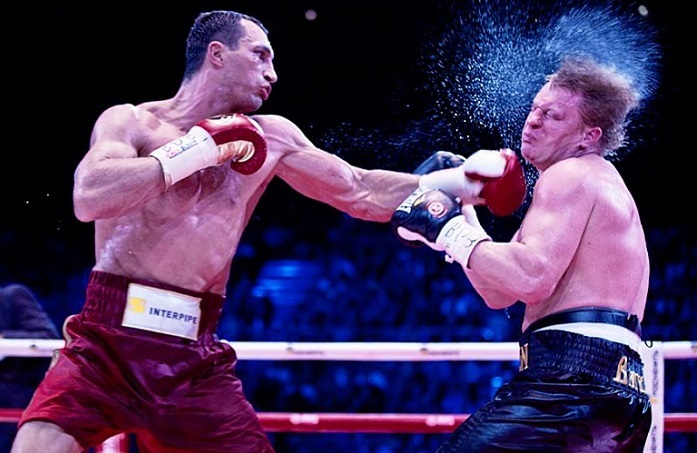 Klitschko tags Povetkin in 2013. Anthony Joshua may well be the most well-schooled and naturally gifted heavyweight since Lennox Lewis, but with only 21 fights to his credit, he is still, to some degree at least, a work-in-progress, as we saw in his rather subdued effort against Joseph Parker last March. 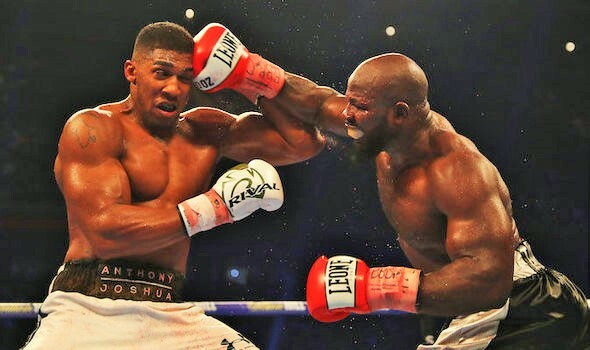 It was a performance which revealed that, despite last year’s impressive victory over Klitschko, Joshua has yet to evolve into a truly accomplished ring general, as he struggled to find openings against the shifty Parker. Much of this stems from the fact that “AJ” tends to be flat-footed and finds it difficult to impose his size, especially as he is not inclined to cut off the ring and set traps. Povetkin is both agile and intelligent, not to mention powerful, and if he draws on the blue-print set by Parker, and if Joshua hasn’t developed more mobility in the months since, the Russian could present some serious technical concerns. Joshua’s performances against Takam (right) and Parker were less than impressive. That said, whether Povetkin has in fact improved his tactics for fighting larger men since the Klitschko defeat remains a difficult question to answer. Between then and now his biggest opponents proved to be little more than his biggest targets, as 6’8’’ David Price and 6’5’’ Johann Duhaupas failed to provide significant challenges. But maybe it’s a moot point anyway. In this writer’s opinion, Povetkin’s impotence against Klitschko was largely attributable to referee Luis Pabon’s inability to control the Ukrainian’s illegal manhandling of the Russian at close quarters, as Wlad used his size to continually clinch, smother and wrestle the smaller challenger until Povetkin was spent. In any case, Joshua is unlikely to use tactics similar to Klitschko’s as he is not as physical a boxer as Wlad, but instead more selective with his punches and movements. However, like Wlad, Joshua boasts a long, stiff jab, a weapon which Povetkin needs to find a way around if he hopes to have any chance of establishing his offense at closer range. The challenger also needs to prove that he has the ability to take Joshua’s punches, as Povetkin was momentarily hurt by David Price in his last appearance and was on the deck thrice against Klitschko. This could well prove to be the bottleneck in Povetkin’s title attempt on Saturday, as Joshua is certainly one of the two hardest punchers in the division right now. Povetkin’s chin may be his fatal flaw. But all things considered, Povetkin does represent a potentially serious threat to the Briton. He’s quick, versatile, and has both the experience and the arsenal to keep Joshua from getting set. And while Povetkin’s chin is questionable, Joshua still needs to reach him with his best shots while avoiding the challenger’s own dangerous artillery, which has knocked out several top heavyweights. It may well prove a serious challenge for the young champion, but if Joshua can prevail, particularly in impressive fashion, then the way may be cleared for the big battle we all really want to see. But that said, the way was already clear, was it not? Mandatory defenses are routinely side-stepped and Wilder was clearly ready, willing and able to face Joshua months ago. So what does a win over Povetkin at this juncture prove? And that’s the point vexing many boxing fans. 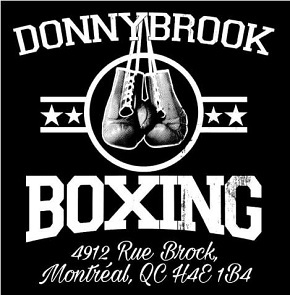 Why take a risk against a lesser-known and less attractive contender when a superfight with Deontay Wilder looms on the horizon? The fact of the matter is that one of the biggest fights in boxing has been hanging in the balance for more than a year now, with nothing more than talk and rumors pointing to it ever actually happening. The danger here is that both Joshua and Wilder have shown degrees of vulnerability in recent fights, not to mention technical shortcomings. So why keep taking risks when any lucky punch or off night has the chance to KO a huge box-office bonanza? The match-up everyone really wants to see. To put this into perspective, Joshua’s victory over Klitschko in Wembley Stadium sold ninety thousand tickets and 1.2 million pay-per-view buys in the UK alone, this being the same Klitschko who was coming off more than a year of inactivity following a disappointing loss to Tyson Fury. 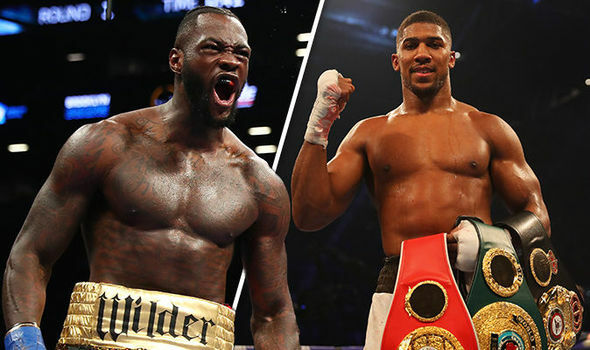 Against a young, undefeated puncher like Deontay Wilder, who has knocked out 39 of his 40 opponents, we have, without any doubt, the biggest heavyweight event since Lewis vs Tyson in 2002, maybe the biggest ever. But all of that can disappear into thin air if one of the two combatants suffers defeat before the match is made. As Lennox Lewis said after being knocked out by 15-1 underdog Hasim Rahman, “This is what happens in heavyweight boxing.” And that was in 2001, when the 6’5’’ Lewis was considered a giant of the division. As we can see, heavyweights aren’t getting any smaller, and they sure aren’t getting any less dangerous. 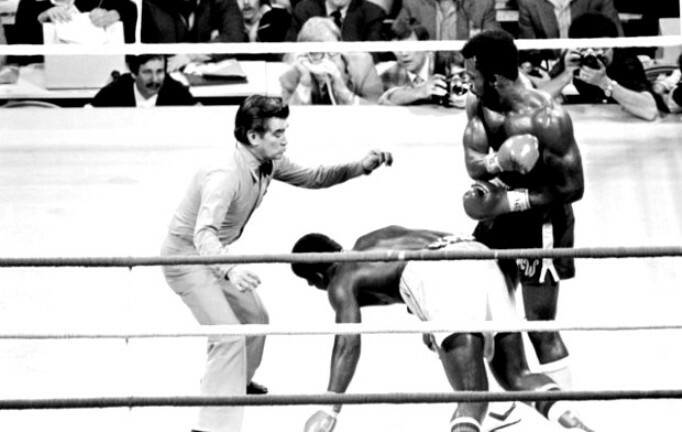 Heavyweight underdogs have a long history of shocking the world with one thunderous shot: think Rahman, Oliver McCall, Mike Weaver or Jersey Joe Walcott. Huge underdog Weaver flattens John Tate with a single left hook in 1980. Still, as we all know, it only takes one punch. 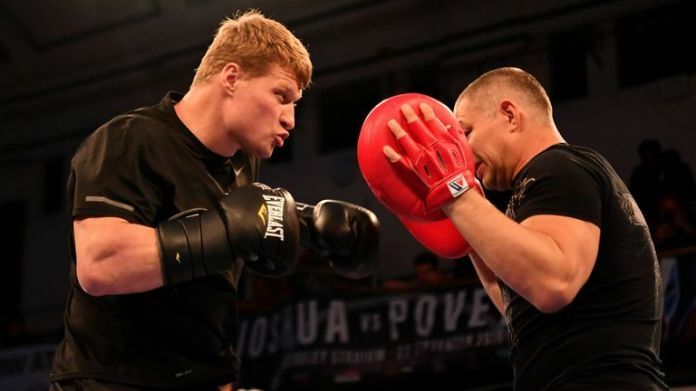 So as boxing fans clamor for a Joshua vs Wilder superfight, the simple truth is that a boxer like Alexander Povetkin does possess the power to land that one titanic blow which tips over an already unsteady applecart. And if that happens, the only thing more devastating for Anthony Joshua than the knockout itself, will be contemplating the truly giant-sized paycheck that got away. Maybe for good. 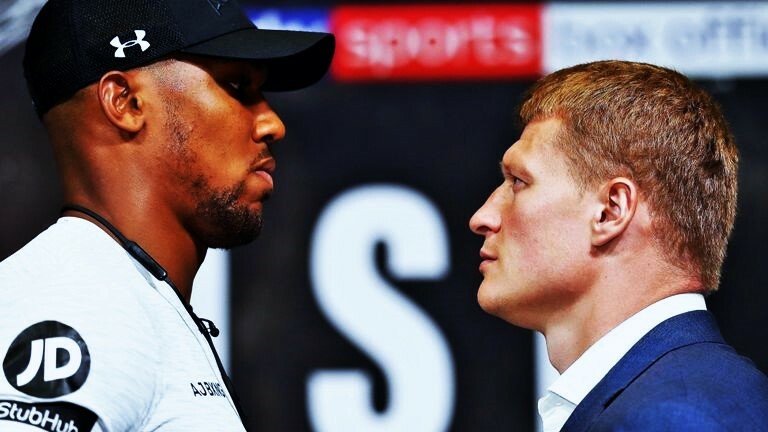 So is Joshua vs Povetkin worth the risk? We’ll see on Saturday.